In his review of Topic's 20 CD set The Voice of the People, Ian Russell prints a map of Britain and Ireland showing where the performers live. (Folk Music Journal, Volume 7, Number 5, 1999, pp.666-677). In a sense, he could just as easily have said that these were the areas where collectors have been active. The county of Sussex features heavily on the map with a strong cluster of dots, and this is not surprising when one considers just how many collectors have visited the region since Kate Lee first called on the Copper Family at the close of the 19th century. Over the years collectors have amassed a large body of recordings which, taken together with the list of songs known to the Horsham singer Henry Burstow, means that we now have a good idea of just which songs comprised the 'core material' that was being sung there throughout the l9th and early part of the 20th centuries. Take, for example, the impressive repertoire of the Copper Family who have so dominated the Sussex folkscene. We now know that many of their songs were also sung by other Sussex singers and that these songs, at least, must have been fairly well-known throughout Sussex at one time or another. 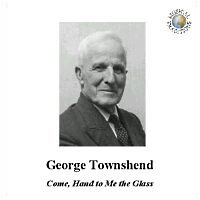 George Townshend was a singer with a number of such songs in his repertoire. George was born on a farm at East Chiltington, near Lewes, on August 29th, 1882. When he was seven years old his father took over The Jolly Sportsman, a public house at East Chiltington. On the opening night George sang The Glittering Dewdrops and When the Spring Comes In, two songs that his father had taught him. Later George would sing in harmony with his father, the latter taking the bass part. Apparently there were many fine singers who drank at The Jolly Sportsman, including Luke and Leonard Welfare, and I wonder if these two were related to Fred Welfare of North Chailey, near Lewes, who I recorded in the 1970's? The Glittering Dewdrops and When the Spring Comes In are, of course, in the repertoire of the Copper Family - some of whom were known to George and his father - as are a number of other songs that George sang, such as Dame Durden, The Trees They 're All Bare, The Mistletoe Bough, Twankydillo and When Adam Was First Created. Many of these songs are now relatively well-known, thanks to the Coppers, but some of George's other songs are not. I Mounted My Neddy is a version of a rare broadside, titled The London Rover, that was printed by John Pitts. Like Young Collins, another rarity, it has seldom surfaced on the lips of traditional singers. Occasionally Rod Stradling has relied too much on Steve Roud's excellent Folksong Index, without, it appears, looking further afield. Yes, Hark, the Rock is seldom seen today, the only other known version being in Alfred Williams' Folk Songs of the Upper Thames, which was published in 1923. But, had Rod actually checked the book itself he would have discovered that, according to Williams, it was 'popular at Aston and Driffield, near Cirencester'. We are also told that there is one American version of the hunting song 'Twas Early One Morning, better known as Dido, Bendigo. Would that be the version printed in the Frank Brown collection of North Carolina Folklore? Or the superb version sung by Will Starks of Clarksdale, Mississippi, that was collected for the Library of Congress in 1942 by Alan Lomax, John W Work and Lewis Jones and recently issued on the Rounder CD Deep River of Song - Mississippi Saints and Sinners (Rounder 1 1661-1824-2)? Nor are we told that the tune for When Adam He Was Created was pinched by the folk from a classical source. (As was, for example, the Yorkshire dance tune The Huntsman 's Chorus). And I think that mention could have been made of the fact that at least two Sussex singers (Harry Upton and Harry Holman) sang All Jolly Fellows that Follow the Plough not as a song in praise of farming, but rather as a form of protest where their fellow farm workers appreciated the irony that they were not 'jolly fellows'. They were, in fact, oppressed by a system that was then in place in rural England. What's more, they knew it! But these are minor points. George Townshend was an excellent singer who deserves to be better known. I had the privilege of hearing him sing once and even towards the end of his life he was a pleasure to hear. These recording were made by Brian Matthews, an unsung hero if ever there was one, who has thankfully allowed Rod to issue these gems. Sound-wise they are not exactly 'hi-fi' recordings, but George's musical ability, coupled with some exceedingly rare and interesting songs, easily makes up for what might be lacking in fidelity. Apparently Mr Matthews also recorded some other Sussex singers. Hurry up, Rod, and get these out soon!